How do the badges on my profile work? What do the three new icons on my profile mean? Every Friend of Eltis has three different badges (and types of points) that represent their activity on the Eltis portal. The Reputation badge is the most representative of the three as it is the average of the Content and Community points. There are nine different levels (from 0 to 8) for each badge. The badges will slightly change in appearance when a new level is reached. You can see the amount of points a user has by accessing their profile page. How do I get more Reputation points on Eltis? How many points do I need to move to the next level? As a Friend of Eltis, simply upload your information via our quick and easy online forms. Click the blue ‘Login’ button at the top of the homepage and sign in using your username and password. On the left underneath your name you will see a collection of ‘new content’ icons. Select the type of content you wish to submit. Then enter your details using the simple form and save the content. If you don’t want to publish it yet (for example, because you might have more details to enter later) then click Save and carry on browsing Eltis. If you’re ready to publish your content, save it, select Needs Review in the dropdown and then click Apply. This is important because if you don’t select Needs Review our editors won’t be alerted to your content and will be unable to publish it. Once you have changed the status to Needs Review, our editors will do a quality check and publish it online as soon as possible. Once you are signed in you can change any details in your profile by clicking Edit profile under your photo. You can also modify your username and password this way. Will you please publish my event/news/case study? Of course! Eltis is a community website where our members exchange information that helps improve urban mobility in European cities – and we encourage you to submit as much content as possible. Once you have become a Friend of Eltis and submitted your content (see How do I submit content? above) our editors will first make sure that it meets the Eltis criteria and proof-read the text. If for whatever reason it can’t be published, our team will contact you to explain why. Remember: as the author of the content, you will be able to edit and update your content as often as you like. What’s the Eltis Mobility Update, and how do I get it? Our monthly Eltis Mobility Update brings you urban mobility news, events and case study highlights directly to your mailbox. 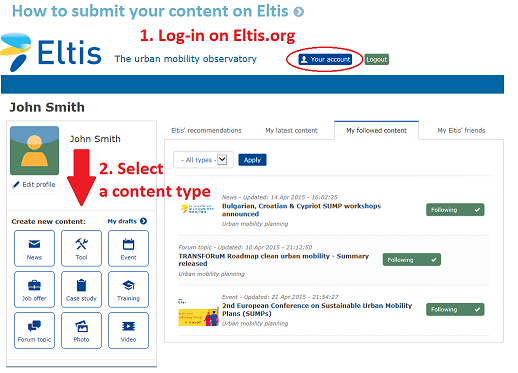 To receive the Eltis Mobility Update, just enter your email address in the Eltis Mobility Update box on the right side of the Eltis homepage. Or get in touch with us and we will add you to our mailing list. That’s a pity – by doing so you’ll miss important news on European urban mobility! 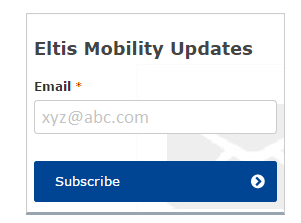 You can unsubscribe by clicking on Unsubscribe newsletter in the footer of any Eltis Mobility Update. Click here to request a new password. Please don’t forget to change the automatically generated password as soon as possible. Don’t panic. 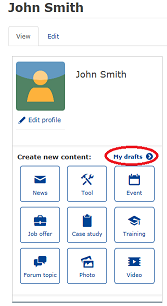 After saving a draft of your content, you need to select Needs Review in the dropdown and then click Apply. Our editors will then do a quality check and publish it online soon. Remember: unless you change the status of your content to Needs Review, our editors won’t see it and will be unable to publish your content. Easy. You can find your drafts by logging into your account and then clicking on My drafts underneath your name and photo.